This article originally appeared in Next New Deal. Although we are only a few months into 2015, it has already proven to be a watershed year for women's rights around the world. On the heels of the International Women's Day March for Gender Equality, the He for She and Planet 50-50 by 2030 Campaigns and the twentieth anniversary of the Beijing Declaration and Platform for Action, international advocates and officials alike are coming together to evaluate the progress that has been made over the past several years. This raises the question: what is the current status of women in the United States? The road to achieving gender equality in the U.S. is quite clearly checkered with significant potholes. There are incredibly large disparities throughout different regions of the United States; southern women are the worst off with regard to employment and earnings. Furthermore, the status of women differs notably by race and ethnicity, with Hispanic women having the lowest median annual earnings compared to other women. In general, women's economic security is directly linked to their family income, which includes earnings from jobs, but women tend to be concentrated in fields that lead to jobs with relatively low wages. Even women who do go into higher-paying fields still earn less than their male peers. This helps explain why, in 2013, about 14.5 percent of women ages 18 and older had family incomes that placed them below the federal poverty line, compared with 11 percent of men. 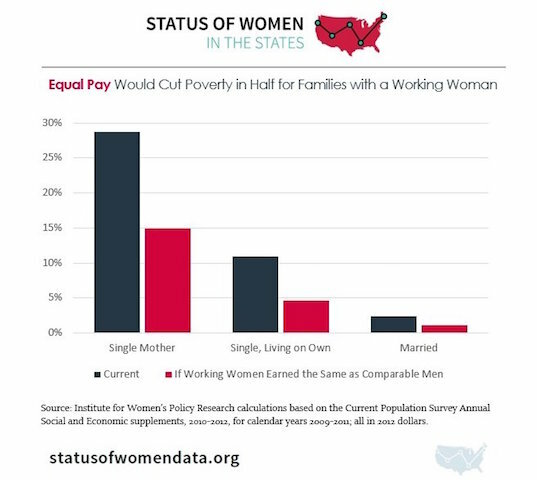 However, even this estimate does not fully capture the extent of the hardship that women continue to face in the U.S.
What can we conclude from this data? As a recent article in The Washington Post puts it: "When it comes to equal pay, the American woman is stuck in a proverbial waiting room. But the number on her ticket, the length of her stay, largely depends on where she lives and to whom she was born." In other words, the status of women in this country is incredibly complex, and as a result, there is no simple, one-size-fits-all solution to achieving gender equality. Gender equality is an intricate mosaic, a picture that cannot be complete without understanding and exploring the dynamic regional, national and demographic factors at play. As a result, we cannot approach these issues without thoroughly peeling back and exploring each layer. It is necessary for all of us to reassess how we measure, monitor and evaluate the status of women so that we can effectively determine both the progress that has already been made toward achieving full gender equality and the challenges and obstacles that lie ahead.